Welcome to the Nikwax blog » Adventure-Crossing of the Alps with Children! Crossing the Alps on a mountain bike together with my children (a son, 3, and a daughter, 13) is something I’ve wanted to do for a while. But before heading off, we had a few queries that needed clarifying. First of all, a 3-year old boy of course wouldn’t be able to cycle by himself, and a child seat on a mountain bike is a definite no-go! Plus, where would we store all the things we would need while on the road? The easiest way would have been to book a planned Alpine Cross Tour, including guaranteed transport service and arranged overnight stays. But that’s exactly what we didn’t want – to know where we’d end up every night. Where’s the adventure in that? What’s more, you can’t really stick to a fixed “timetable” with a 3-year old! So, this meant, that we’d be taking with us everything that we needed throughout our trip: tent, sleeping bags, therm-a-rests, clothing etc., and, ahh, yes, Pampers too, since we didn’t know whether we’d reach a hut by the break of dawn or not. Crossing the Alps with all that gear? Our friends were shaking their heads rigorously, but we found a solution for everything. Our son got a space in a tout terrain single trailer and to pull this, we ended up using a Pedelec (E-Bike) with 29” wheels, a Haibike XDURO RX. 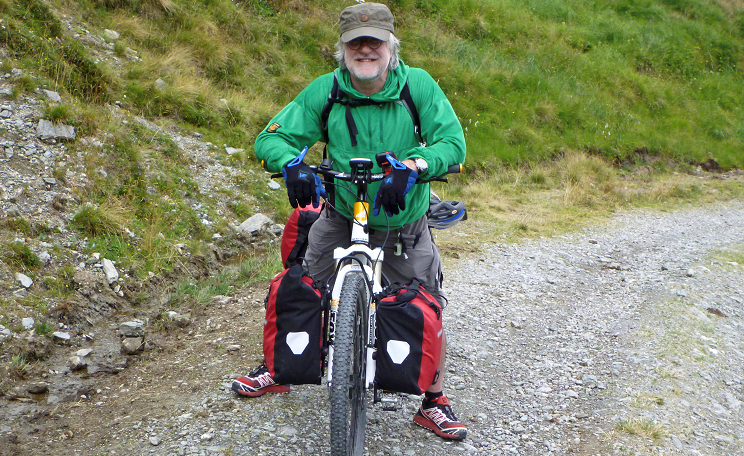 All our gear was stowed in an Ortlieb Front-Roller at the front wheel and a Pack-Roller at the rear wheel. It summed up to 60L pack space! Not much for three people, though. So we had to restrict ourselves, but this was not to go at the expense of safety, either! 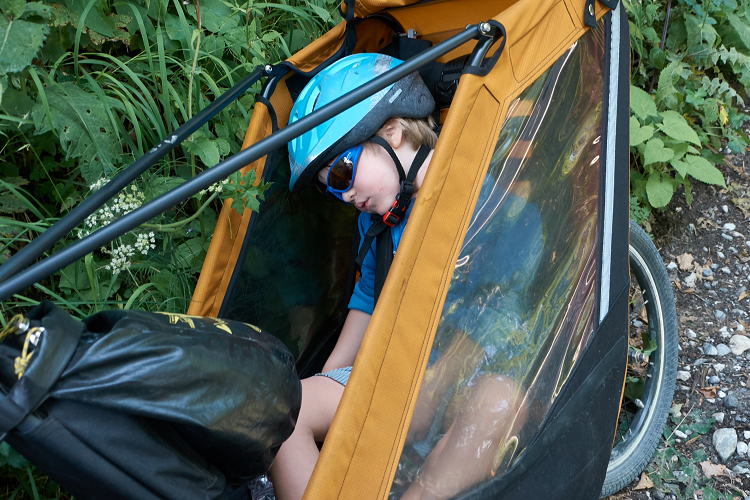 Synthetic sleeping bags were not an option – too much pack volume. So we went for down bags that packed small. And to avoid the down getting wet, we treated them with Nikwax Down Proof. And for the same reason, our warm Fleece clothing received a DWR treatment with Nikwax Polar Proof. We learnt just how important these Nikwax treatments would be for us when we were caught high up in the Tux Alps by a violent thunderstorm. Water came down on us from all sides and found its way to our inner layers despite our protective hardshell jackets. We literally got soaking wet! Once the thunderstorm had passed, it continued to rain and slowly got dark, so we looked out for a good tent space. This did not prove to be easy, particularly because there was no flat area up there, so we had to descend a few kilometres back down in the dark. Luckily, we still had some dry base layers! We quickly put these on and slid into our warm sleeping bags. Our fear of having to put on our wet clothes again the next morning proofed unsubstantial: Our Fleece jackets had dried in the tent over night, they had only soaked up a little water thanks to Polar Proof.